Imagine this Mediterranean jewel, graced by five acres of a richly vegetated estate while overlooking an expansive lake view. It's sure to be the talk of the town with its rich finishes of stone banding and columns, natural wood doors and course timbers for the trellis. The dramatic appeal and inspiring design create anticipation for its contents and what surprises it holds. Upon entering the foyer with its grand sweeping stairs, this home carries its volume to the second floor bridge. Straight ahead you will notice the spectacular living room opening to the second floor, with a clearstory alignment of a radial glass wall and graceful views across a reflection pond, dropping off to the pool below with a disappearing edge. A gallery runs from right to left of the foyer. To the right holds a formal dining, large enough to seat at least two families or more. On the way to the kitchen is a wet bar and guest bath. As you pass below an arched opening into the main living area, the amenities are abundant with a corner fireplace, built-in entertainment center and zero corner pocket sliding glass doors in the family room. A radial dinette with solid mitered glass allows seamless views to the outdoor areas while bringing in an abundance of light to this remarkable kitchen. Also on this level is a grand utility room, large guest suite with porch and a four car garage with storage. The enormous lanai is perfect for entertaining with storage and outdoor sports bar complete with television and seating with enough room left over for a dining table and outdoor furniture. 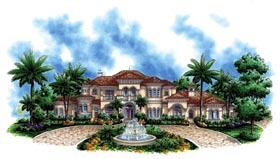 To the left of the foyer you will find the exercise room, study and an elegant master suite. The master suite is complete with a fire place, sitting area and French doors leading onto the lanai. It also has full his and her baths and walk-in closets. The second floor can be accessed by either the stairs or elevator. The top of the stairs land on a bridge overlooking the foyer and living area. To the right hosts a theater and play room. To the left, two bedrooms with private baths and walk-in closets each accessing private balconies add to this home's overall function and uniqueness. 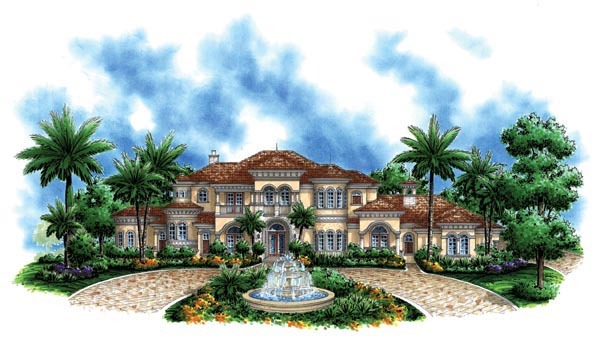 Question: Does the home entry have stone around entry on first level and stucco above windows on the second?